The Braggot is a complex, full and nourishing drink of honey and barley that dates back as far as 12th century Ireland. A mead and ale hybrid that is abound in Norse Mythology, braggots were often mixed by innkeepers at the point of sale, with the option of additional herbs and spices. 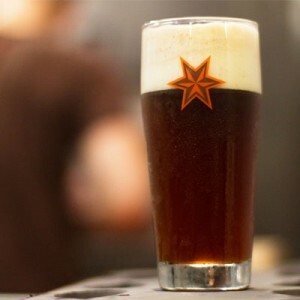 Brewers would make their own braggot as well, however, and the Sixpoint braggot is fermented as a single drink, using one-third raw wildflower honey and two-thirds malted barley. In the old world spirit of a spiced brew, it has a dash of coriander and peppercorn, to complement the aroma, alongside Horizon hops, for balance and bittering. The honey comes from Glenn and Becky Magrum’s hives in Ashland, Ohio. The Magrums fill all their honey by hand, and use no preservatives. Their unfiltered honey provides uncommon flavor to MS #17. The ancient Greeks said that a mead tasting of honey is as good as a wine still tasting of grape. So don’t expect overt honey as the dominant flavor. Instead, a variety of specialty malt and the raw wildflower honey provide an extraordinarily textured flavor and nose. You’ll get notes of chocolate, nutty toast, mead, and full-flavored roasted bread. It’s a rich, smooth beverage ideal alongside a hearty feast. Available this week around NYC and beyond. Find the Braggot and all our other beers on our Mobile App.